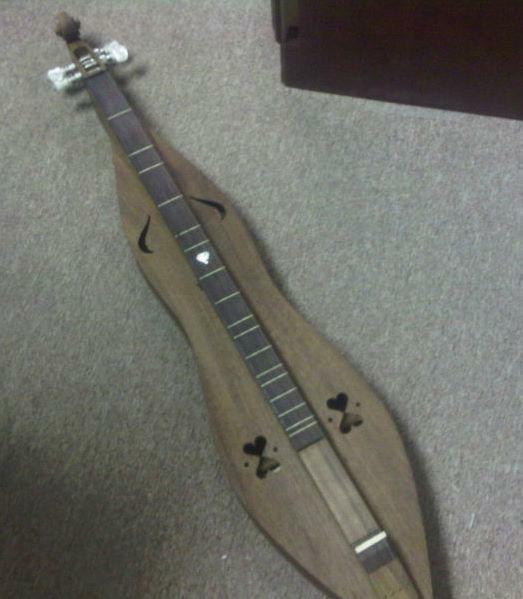 A friend on Facebook sent me a link to an Ebay auction for a dulcimer I had made in 1980. Here is the picture from the auction. When I first saw the photograph I recognized the shape, upper sound-holes and some other features as design elements I had used in the late 1970’s and early 1980’s. The lower sound-holes seem vaguely familiar as does the pearl heart inlay at the 7th fret. I made a number of dulcimers back then with a traditional peg-box using either wooden friction pegs or geared banjo tuners. I did not immediately recognize the peghead as one I had made. I sometimes carved scrolls on the end of the peg box but they were a design based on some early viols. Though the photograph is not very clear this scroll seems more like that of a violin. I could find no reference to my name in the auction listing. I wondered if someone had copied my design and added a violin scroll. On further inquiry my Facebook friend said he wrote to the owner who said it had my name, a date from 1980 and a Brooklyn, NY address on the label – it must be one of mine! Either the angle of the photograph makes a scroll I carved look like a violin scroll, I made a dulcimer with a violin scroll and don’t remember having done so, or someone carved or added it later on. Considering that I made it 31 years ago I am entitled to not remember! Claudia Cardinale With A Dulcimer? Glad to hear it was restorable and playable. Interesting that the peghead was replaced; I’m sure there is a story there. Hi Tom. Happy Birthday! Let me know what kind of shape the dulcimer is in when you get it. I haven’t seen or heard of it for 31 years so I hope it was well maintained and cared for! I gave myself a birthday present and purchased this instrument today. When it makes its way to utah I will let you know how it sounds, I am anticipating greatness. Thanks, Robin. I’d like to hear it too! I think I’ll use that. Thanks! A good looking instrument–the violin scroll is interesting, whoever did it! When I can’t remember something, I always tell people, “I’ve slept since then.” Certainly true in this case! Expel the world from your heart and place it in your hand or your pocket and it shall not harm you.